Celkon has launched its new Android tablet named CT910+ HD in India that supports 3G voice calling feature. 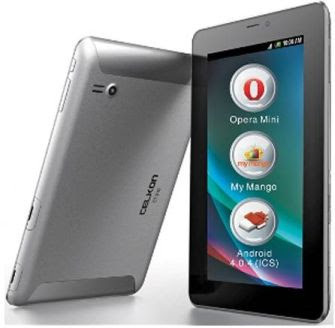 The tablet is successor of the CT910 tablet and it has the similiar configurations like as Celkon CT888 tablet. It comes with 7-inch capacitive touch screen with 960x540 pixels resolution. It runs on Android 4.1 Jelly Bean operating system and powered by a 1 GHz dual core processor with 512 MB DDR2 RAM. Celkon CT910 Plus tablet has 4 GB of internal memory and the external memory can be expandable up to 32 GB with microSD cards. It features a 2 MP rear camera and 0.3 MP front facing VGA camera for video calls. The tablet has a slot for 3G Sim card, so you can talk to anybody and can enjoy with 3G internet. It is packed with a 3500 mAh batter and it has the connectivity options are 3G via sim card, Wi-Fi, Bluetooth and GPS. Celkon CT910 plus is priced at Rs. 7999 and it will be available on retail stores and online from first week of July 2013.